PIXMA MP620 is a Wireless Inkjet Printer that will change all the rules about where and how you can print better. 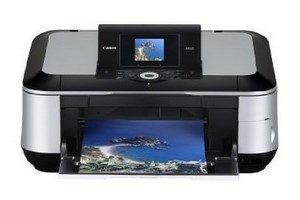 Canon MP620 is able to print wirelessly from any room in your home via WiFi. Want to work without a computer? You can print photos directly from a compatible memory card, digital camera or camera phone, even Bluetooth devices via the optional BU-30 Bluetooth interface, preview and enhance your images on a 2.5″ LCD screen, or print over an Ethernet cable network and print from the computer wired in another room. The MP620 All-In-One will produce a durable 4″ x 6″ photo with a spectacular 9600 x 2400 dpi color print resolution in about 41 seconds. With its new 5-color ink system, this versatile printer ensures real and bold life color, black text Copy of documents will be more faithful to your original documents, and your scans will produce exceptional 2400 x 4800 dpi results.